It has been 16 years since the last three provinces were added to the Kingdom of Thailand. These were Amnat Charoen, Nong Bua Lam Phu and Sa Kaeo. Now, proposals for making the seaside resort district of Hua Hin the Kingdom’s 77th province are meeting mounting opposition from locals in Prachaup Khiri Khan and Phetchaburi provinces. Veteran MP Chaowarin Latthasaksiri said the idea of making Hua Hin a new province dates back to 2003, but had been shelved until recently, when the Cabinet Secretary’s Office resurrected the idea and forwarded the plans to the Interior Ministry. Hua Hin is in Prachuap Khiri Khan province and, if it breaks away, would take a couple of nearby districts with it, including Cha-am, which is in neighbouring Phetchaburi province. The new province would be named Klai Kang Won (Far From Worries), after Klai Kang Won Palace, built in the time of King Rama VII in 1928 as a summertime retreat for the royal household. 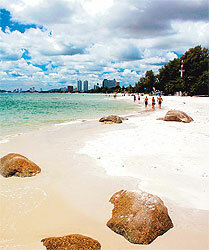 The palace, often visited by the King, has become a landmark in Hua Hin, about 230km from Bangkok. Klai Kang Won province would have Hua Hin City as its centre and consist of Pran Buri and Sam Roi Yot districts, which are now in Prachuap Khiri Khan, and Cha-am district, which is now part of Phetchaburi. The proposal for the 77th province is planned to coincide with Her Majesty the Queen’s 77th birthday in August. Meanwhile, Prachuap Khiri Khan governor Panchai Bowornrattanpran conducted widespread inquiries with local people and private agencies over the issue. He claimed locals in the province all oppose the idea. Hua Hin mayor Jira Pongpaibul said most locals from remote districts of Prachuap Khiri Khan and elsewhere are also against the idea, largely for fear that the new province would otherwise drain up human resources, as well as state funding from all other parts of Prachuap Khiri Khan and leave its outlying areas unattended. The mayor said strong objections to the scheme seemed to have come from those who shuttle between Hua Hin and other districts on a regular basis or are related to the concerns of villagers throughout remote areas of Prachuap Khiri Khan. “The rural people fear economic disparity between the old province and the new one would be so great that too many people might migrate to the new province,” he said. However, Mr Chaowarin said he had earlier been told by Hua Hin residents that they prefer to have a province of their own to spare themselves the tiring trips to the remote provincial seat of Prachuab Khiri Khan, which is 100km to the south of the seaside district. “Given the rapid economic boom of Hua Hin over the last several years, a new province should be set up right there, with Klai Kang Won Palace being the highly-esteemed landmark in which local people could take pride. Siripong Manakittiphongchai, an electric appliances merchant at Hua Hin market, said the city has rapidly expanded itself into adjacent hillside areas due to quick rises in the population, including an increased number of expats from around the globe. Aphiradee Sompran, a bank employee and native of Prachuap Khiri Khan, said Hua Hin was prosperous, with various businesses starting throughout the busy city. Ting Chayamano, a farmer in Pran Buri district, said he has a dozen relatives working and living in Hua Hin, and they could not tell Hua Hin from Pran Buri, due to its geographical proximity. They would not care if Hua Hin split off to form a new province. Nevertheless, Democrat MP Montree Panoinond of Prachuap Khiri Khan said not only Hua Hin residents, but those in other parts of Prachuap Khiri Khan have always cherished the fact that Their Majesties reside at the palace, without which the district might never have prospered in the first place, and that it would not be appropriate to take that pride away from the rest of the province. Several years earlier, some MPs had pushed a plan to establish Suvarnabhumi Metropolitan, named after the international airport, as a province, but had met with strong opposition from local leaders and MPs of Samut Prakan. Mr Jira, Hua Hin’s mayor, added that the remnants of Prachuap Khiri Khan might not be able to sustain provincial status if Hua Hin and other districts break away. Democrat MP Kamphol Suphaphaeng of the adjacent Phetchaburi province commented that most of his constituents would almost certainly disagree with the idea of giving away Cha-am to the new province. Though the economic performance of Cha-am would never surpass that of Hua Hin, the MP said, Cha-am’s residents are proud of their own identity, given differences in culture and traditions between the two districts. Instead, Mr Jira suggested Hua Hin be upgraded to a “special administrative entity”, like Bangkok and Pattaya where governors are elected by the people instead of being named by the central government, and be administrated independently. Hua Hin now has a population of 200,000, about 25% of whom are native to the district, and attracts an estimated two million tourists, foreign and Thai, per year, generating tens of billions of baht for businesses.